This week is Men’s Health Week, so I want to focus on the issues that every man needs to know. Yesterday, I wrote about testicular cancer and how the risk of developing this type of cancer directly relates to a sedentary lifestyle. 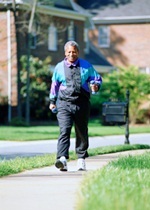 I recommended men of all ages get more active in their pursuit of a healthier lifestyle. However, in this article about men’s health, I’ll be addressing the common exercise mistakes that men make. Men have a habit of making the same type of exercise mistakes in the gym. These mistakes account for the majority of injuries I have seen as a health care provider, a strength and conditioning specialist, and a health coach. It’s very important to warm-up before you run. In my opinion, the most effective warm up is stretching and running drills. Take 10 minutes before your run to warm-up and you will have fewer injuries to your legs, hips, and lower back. Most of the time, I have noticed that men sometimes do not wear the right type of running shoe. If you have a tendency to pronate and you are running on a hard surface, you will need a shoe that can support the arch of your foot and correct the excessive pronation. Add proper footwear to your exercise tips to avoid injury. If you don’t build up your fitness gradually and give your body an adequate period of time to adapt, this can lead to nagging injuries involving the feet, legs, hips, and lower back. It will also impede your training results. Here’s another exercise tip: gradually increase your running distance and the number of running sessions throughout the week while allowing for adequate time to recover between sessions. I have witnessed men signing-up to complete five or 10 kilometer runs very early in their running careers. Although competition can be a good thing, I would rather you be capable of easily finishing this distance than just being able to barely complete it. On race day, when the adrenalin starts to flow, I have seen some men literally kill themselves to outdo someone else. These weekend warriors, as I refer to them, have to look at their level of preparedness before entering any type of race. This exercise mistake can be costly. PLUS: Can exercise make you live longer? Improper training technique in the gym can get you injured quite easily. I have seen many men lifting weights without ever receiving any type of instruction. Not only can this be a risky situation but you’re not as able to progress as much as you can with the right instruction. My advice is to get a professional to teach you how to properly use the equipment—that’s one vital exercise tip. The reason why some people do not get the results they would like at the gym is because they do not have proper exercise form. Men, more than women, tend to make this exercise mistake: they lift heavy weights instead of gradually training themselves. If you focus on weight and not technique, you risk injury. Progressive resistance applied to your exercises is great, but your body needs time to adapt to increasing loads. The key is to perform each repetition with correct form regardless of the weight chosen. In the same manner as men associate the amounts of weights lifted with success, so too do they think that doing more per session or adding more sessions are better than less. This is true to a point of course, but like running, weight training sessions and session volume have to be carefully planned around your training level, age, and other activities. It’s very important to realize that weight-training adaptations occur at rest so recuperation is vital for the training response to work! Brott, A., “Blueprint for men’s health,” Men’s Health Network web site; http://www.menshealthnetwork.org/library/blueprint.pdf, last accessed, June 10/13.